“The Turkish president, Recep Tayyip Erdoğan, has achieved victory in a historic referendum on a package of constitutional amendments that will grant him sweeping new powers. 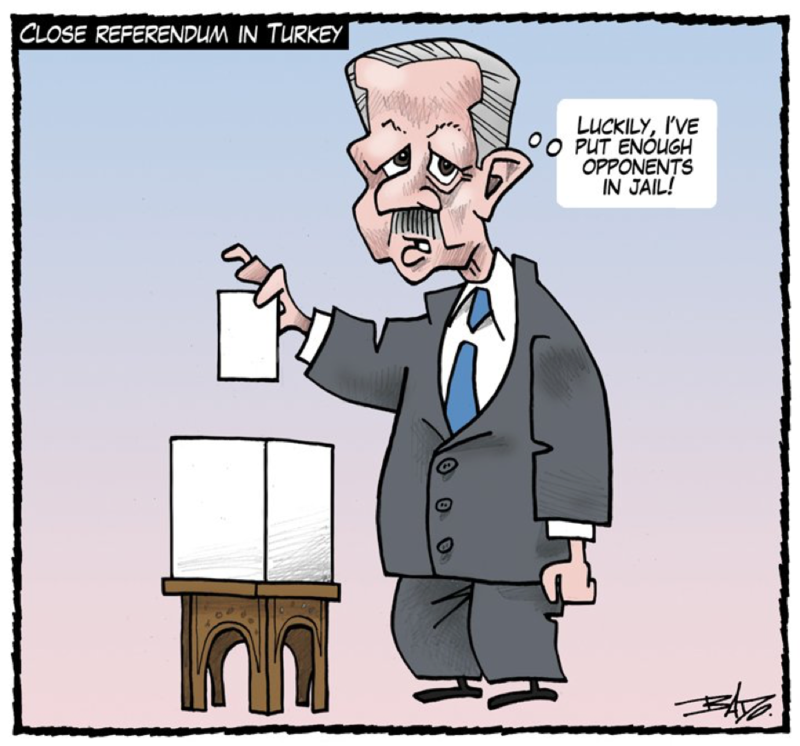 “Sadi Güven, the head of Turkey’s high electoral board (YSK), confirmed the passage of the referendum on Sunday night, based on unofficial results. “The yes campaign won 1.25m more votes than the no campaign, with only about 600,000 votes still to be counted, Güven told reporters in Ankara, meaning the expanded presidential powers had been approved. “… The result of the referendum sets the stage for a transformation of the upper echelons of the state and changing the country from a parliamentary democracy to a presidential republic, arguably the most important development in the country’s history since it was founded on the ashes of the Ottoman Republic [sic!]. “Erdoğan said he would immediately discuss reinstating the death penalty in talks with the prime minister and the nationalist opposition leader, Devlet Bahçeli. The president said he would take the issue to referendum if necessary.” (Kareem Shaheen, ‘Erdoğan clinches victory in Turkish constitutional referendum’, The Guardian, 16 April 2017). “…Some argue that, in his eagerness to bolster his own power, Mr Erdogan has wavered in his devotion to the Islamist cause. ‘Is Mr Erdogan still a Muslim?’ a neighbourhood elder holding court near the mosque entrance asked jokingly. ‘He’s run to the middle to get his referendum, but he has forgotten us.’ For some voters, Mr Erdogan’s campaign was countered by a vestige of the past — the followers of the country’s original Islamist politician, Necmettin Erbakan. Mr Erbakan, once a mentor to Mr Erdogan, may be dead, and the remnants of the political party he founded, the Felicity party, withered, but its network of clerics and elders strongly opposed the president. Three senior figures in the party, who asked for anonymity, blame Mr Erdogan for what they see as his political opportunism — and his failure to mount a wholesale break with Turkey’s secular constitution, the path they see as the nation’s true will. ‘If you ask the Felicity party, they think the AKP has lost total touch with its Islamist background and gone into corruption and cronyism,’ said Ezgi Basaran Karli, an academic at St Antony’s College at Oxford university. ‘It’s become a pragmatic, neoliberal party, and that’s detrimental to the Islamist movement’ (Mehul Srivastrava, ‘Erdogan smarts from rebuff of the Istanbul faithful’, Financial Times, 22 April 2017). Increased presidential powers for Erdoğan are quite obviously bad news for workers. For that matter, the concentration of power in the hands of any specially chosen representative of the bourgeoisie in any system of bourgeois dictatorship is bad news for workers. If that person is conservative, chauvinistic, religious, personally ambitious and corrupt, it’s nothing out of the ordinary. President Erdoğan is all of the above, but so are most bourgeois career politicians. What has really influenced the western media narrative in the Turkish referendum is that Erdoğan, whom imperialism attempted to remove by staging a failed coup, continues to plough his own furrow. His closer working relationship with Russia, whether he is genuine in it or not, along with reports that Russia is prepared to discuss selling Turkey the S-400 long range missile system (see ‘Erdogan set to discuss S-400 missile systems with Putin, Turkish minister’, Press TV, 24 April 2017), must really rankle – indeed it may just be the sort of thing that gets President Trump on the phone offering his congratulations whilst most EU leaders are busy drafting their press statements of cautious condemnation. “The current system [First passed the post – FPTP] has virtues, as well as flaws. One is simplicity: voters place a cross next to one name on the ballot, the candidate who secures the most crosses wins. It allows for ideological clarity, and thus accountability. Historically, FPTP has favoured the election of majority governments, able to defend a clear programme or face ejection at the next election. In much of Europe, where coalitions are the norm, political compromise is seen as a virtue” (‘Yes or no’, The Economist, 28 April 2011). Although Izmir may seem like a billion miles away from Cradley Heath [a small town in middle England] (especially if you’re standing out of doors), Turkey is not so different from Britain or any other EU country. The idea that the EU is some kind of workers’ and refugee paradise whilst Turkey is a dictatorship is liberal tripe. The oldest bourgeois democracies are the oldest dictatorships. And that is to say nothing of the setting up by a half dozen of the oldest EU imperialist states of some of the worst tin-pot dictatorships in existence today, especially those of the Gulf States cobbled together by Anglo-French imperialism in the 20th century. If we may be permitted by the reader to compare big things with small, it is worth mentioning here the attempts presently under way in Britain to establish local dictatorial powers in place of elected local authorities. For years, the CPGB-ML has advocated against the proposals made for devolution in Britain, not because the CPGB-ML is against more power for local people in the decision-making process, but rather because the CPGB-ML is in favour of it. Just like the transfer of powers from parliaments to prime ministers, the transfer of powers from local authorities to ‘elected’ mayors are just as clear an attack upon democratic rights. Despite overwhelmingly rejecting the idea for local mayors, a great many cities and regions across Britain are being forced to vote for mayors in May 2017. Most candidates on offer like to push their business credentials, such as all those in the West Midlands mayoral campaign where even the candidate of the Communist Party of Britain is keen to appeal to voters as a responsible partner in delivering public transport infrastructure! Of course the CPB candidate is mere hog-fat. The real competition is between the candidates put up by local businesses, promoted by capitalist backers and who will take up their positions of power in service to the powerful financial backers who got them to the top rather than any fidelity to the electorate. They are wholly unaccountable and their present powers are just the thin end of the wedge. It leads British workers to ask why it is that capitalism is so keen to reduce the power of local authorities and national assemblies and parliaments and replace them with chief executives and the like. Such a push is clearly aimed at reducing the democratic leverage ordinary people have through local authorities and parliaments. Not only do we have in recent history prime ministers taking the entire country to war without the need to so much as consult parliament, in Britain, the oldest ‘democracy’ of them all, but the bourgeoisie was able to accomplish the task without so much as a referendum altering constitutional powers. Indeed, as many a British bourgeois democrat will tell you, the great beauty of the English constitution is its near total absence in writing. Whilst our bourgeoisie is skilled at following its own interests in a way which preserves its class unity, the Turkish bourgeoisie is split and has the unhappy task of writing and rewriting its constitution. First it had to carry through its reforms using the AKP and secondly it now relies on the waning personality of Recep Tayyip Erdoğan himself. We fully endorse the statement of Kemal Okuyan, leader of the Communist Party of Turkey, following the referendum, in which he summed up the origin of the referendum and the need for the workers of Turkey to push back not only against attacks on parliamentary power and religious encroachment upon secular values, but to fight for the socialist alternative to imperialist crisis itself! “It is the bosses who have been advocating for the presidential system for years. We know that the imperialist centres also pushed for a system with strengthened executive powers. The only problem is the extremism and rash manners of Erdoğan. A ‘Yes’ with a narrow margin would have restrained Erdoğan on the one hand, and keep in force a ‘program’ with a wide space for manoeuver for capital on the other hand. They achieved what they desired. “Imperialism is in crisis. And the capitalist order in Turkey is on the brink of a very serious economic crisis. Lack of organisation in such a period is fatal. We insist in our call. The people in Turkey should be organised. And secular sectors should leave behind all heedlessness, ‘We don’t mind the exploitation and injustices continuing as long as they don’t mess with our raki (an alcoholic beverage) or the length of our skirt’; there is no other choice.